Well I've gone and done it. Wrote 500 words - the actual premise of what to write came quite easily. Sticking to 500 words? Well that's a whole other ball game, challenging is not the word. Deserve a badge just for completing that party of the fun and games. 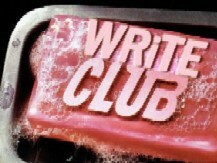 I participated in Write Club last year and it was a blast reading and voting on everyone's entries. Wish I could participate again this year, but I'm knee deep in edits. Enjoy and good luck!